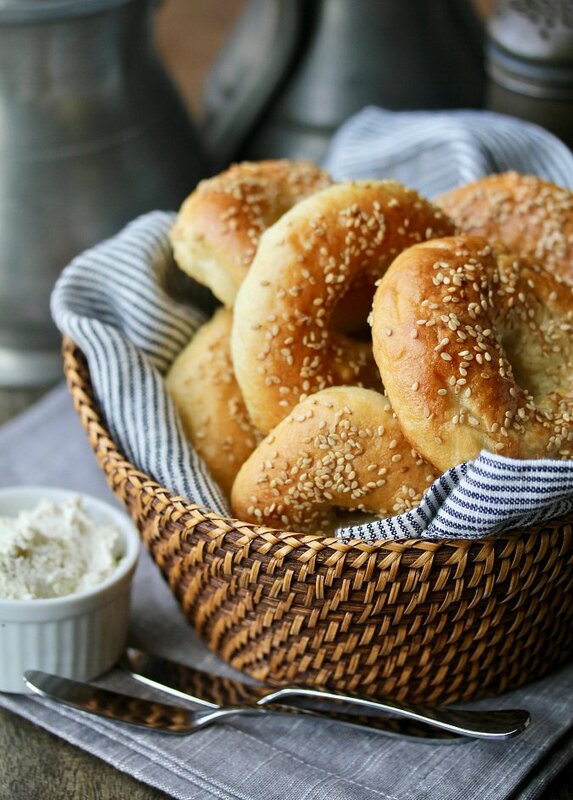 These bagels also get extra softness and from the addition of potato water in the dough. You boil a chopped potato and then use the resulting water in the dough, saving the potatoes for another purpose such as mashed potatoes or hash browns. I refrigerated the cooked and drained potatoes and used them the next day for a bacon and onion hash. Delicious. Egg bagels are an American adaptation to bagels, and are delicious with smoked salmon, capers, and cream cheese. They are still boiled and baked, just like traditional bagels. which gives the crust its chewiness. While bagel purists might draw a line in the sand when it comes to adding eggs to bagels, these were seriously amazing. They were wonderful straight from the oven, plain or spread with a little butter. They were also very tasty toasted and topped with herbed cream cheese and smoked salmon. These bagels also make fabulous sandwiches when filled with meat and cheese or chicken salad. 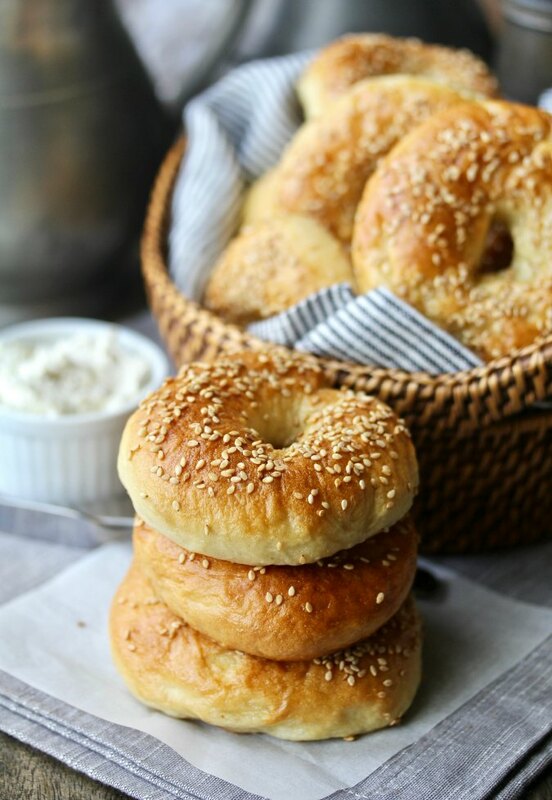 This month, the Bread Baking Babes are making Egg Bagels, a recipe from Beth Hensberger's book, The Bread Bible: 300 Favorite Recipes, as introduced by Karen of Bake My Day! Before we get to the recipe, I want to acknowledge the Bread Baking Buddies who baked along with me when we made Bao Buns. First, I'd like to thank Kouky of the blog Cuisine à 4 Mains. 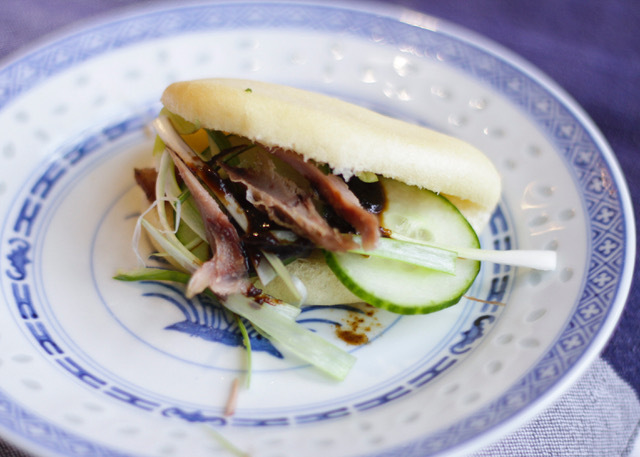 It is a French blog, and I love the name of the steamed bao buns as translated into French: Petits pains Taiwanese à la vapeur. Here is a photo of her Bao Buns. Her filling and buns look fabulous. I'm so thrilled that both Kouky and Shirley joined us last month. Their Bao Buns are pretty darn gorgeous. Thank you both for joining in. 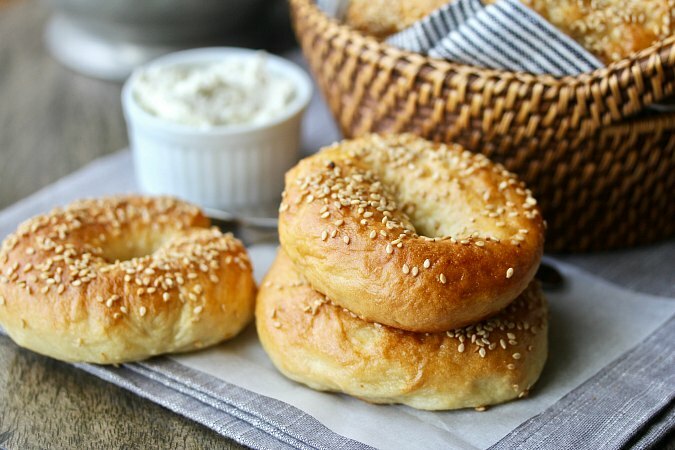 If you'd like to be a Bread Baking Buddy this month, just bake these bagels and send an email and photo to Karen of Bake My Day to let her know. You can also share your results on our Facebook page. You don't have to be a blogger. I'm so happy that Karen introduced us to this recipe. While bread people can be quite opinionated, I believe that there is room in this world for bagels with eggs in them... They are worth exploring and tasting. They are delicious. I cut the original recipe in half and got 16 bagels. While I'm normally fanatical about weighing dough out to get uniform rolls or bagels, in this case, I just divided the dough knowing that some pieces would be larger than others. I was especially excited with the smaller bagels. 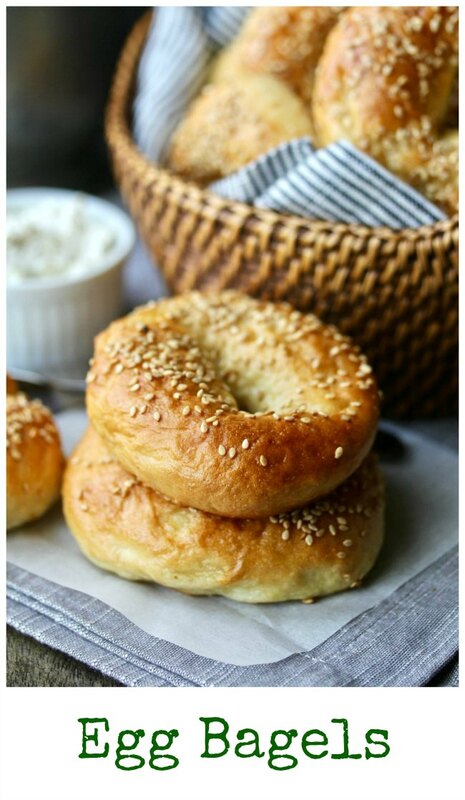 I bet you could get about 20 smaller bagels from this recipe if that's your preference. Put the potatoes in a saucepan with the water and bring to a boil. Simmer until the potatoes are fork tender. Drain the water into a bowl and measure 1 cup of potato water. Let cool until 110 degrees F. Set the potatoes aside for another purpose. Combine the yeast, sugar, salt, and one cup of the flour in the bowl of a stand mixer. Add the potato water and the oil. Beat with the paddle attachment on medium speed for 2 minutes. Add 1/2 cup of the flour and the eggs and beat again on medium for 2 minutes. Switch to the dough hook and add the rest of the flour, 1/4 cup at a time, until you have a soft tacky (but not sticky) dough. If the dough is still sticky and does not just barely clear the sides of the bowl, add more flour, 1 tablespoon at a time, until you have a soft dough. Knead with the dough hook on second speed for 5 minutes. Place the dough into an oiled bowl or dough rising bucket, cover with plastic wrap or a damp towel, and let rise until doubled, about 45 minutes to an hour. Heat the oven to 425 degrees F and line two baking sheets with parchment paper. Gently deflate the dough and divide it into 16 pieces. Form each piece into a ball, and poke a hole in the center with your finger. Stretch the hole to about 1 inch, and then spin the dough around your finger to get a fairly wide hole (which will shrink when you set it down). Let the bagel rest on a floured surface as you shape the rest of the dough. Bring a large saucepan of water to a boil, and add either the sugar or barley malt syrup. Reduce the heat to a low bowl. Add four of the shaped bagels to the water. When they rise to the top, flip them over and let them simmer for 3 minutes. Remove them with a slotted spoon or spatula to a parchment lined baking sheet, about 1 inch apart. Repeat with four more bagels. You should be able to fit 8 bagels on one baking sheet. Brush the tops with the egg wash, and sprinkle with the sesame seeds. Bake the bagels for 25 to 30 minutes, until golden brown. Transfer the bagels to a cooling rack. While the first 8 bagels are baking, boil and top the next 8 bagels. You can add them to the oven when they are ready, and rotate the baking sheets as needed on your oven racks. Just remember which baking sheet is which. they are totally new to me, had never heard of egg bagels... nothing like a little stop at KKS to learn something new! I really hadn't heard of them myself until recently, but I was very happy with them. Lovely bagels! Your thought of smaller bagels really appeal to me... mini bagels in all flavors! I've got to try that soon! Oooh!! BBBuddy Steamed buns too! Excellent! Their steamed buns look great, don't they? Oh yes, mini bagels appeal! Love the color and topping on yours, they look so lovely. I'll definitely be doing that next for sure! Bagel sandwiches.... I need to make these just so I can have bagel sandwiches! Gorgeous color on your bagels! Your bagels look lovely Karen! I agree, there is room for egg bagels or any bagels, for that matter. 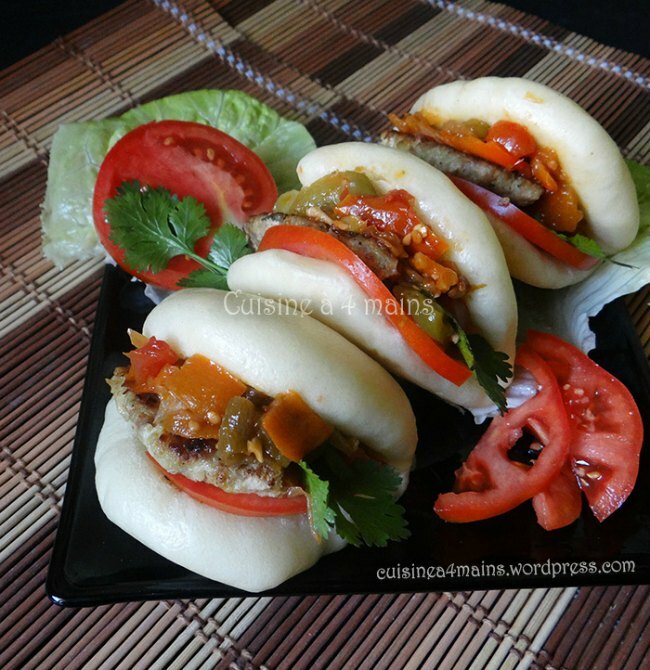 The Steamed Buns from the Bread Baking Buddies look fabulous! Thanks Cathy. I was excited to hear from Buddies who participated.